Clearly, they're not done with us. When I first logged onto my Instagram account I was very confused to be seeing almost all of my followers post the same picture of a brown egg. After tapping through multiple stories, I finally decided to click and find out what this whole thing was about. "Let's set a world record together and get the most liked post on Instagram. Beating the current world record held by Kylie Jenner (18 million)! 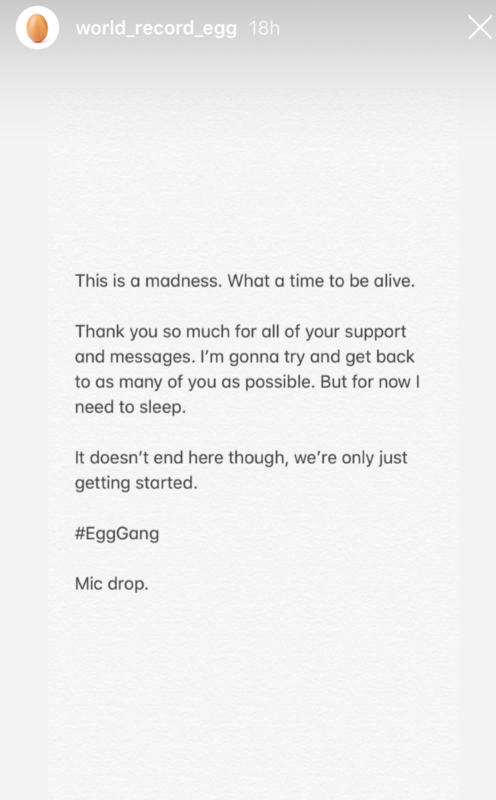 We got this 🙌 #LikeTheEgg #EggSoldiers #EggGang"
At first, I didn't want to play into the user's game of trying become viral over such a ridiculous post and simply kept scrolling. However, ignoring it and going about my day seemed to be impossible. The egg was everywhere. Other celebrities were in on the game, as well. So naturally, I gave in and decided that double tapping was not a big deal and that the person might not even reach their goal. No more than 24 hours after I liked the post, they not only reached their goal but were on a steady climb to surpass it. The egg didn't take this feat lightly, in fact, they posted this photo below on their story in response to their acquired fame. What a time it is indeed. A time where it's this easy for people to gain publicity or celebrity status. I never would have guessed this is how we would ring in 2019. When the egg announced that they would be releasing merchandise, I thought to myself, how very typical and smart to profit off of all this attention. However, I was pleasantly surprised to find out that they donate 10% of every purchase to a new mental health charity each day. As a way to foreshadow the big things to come, the account posted this picture this week. What does the crack in the egg mean? How long until it breaks? What will be in it? I guess we will just have to wait and see what bold move the egg does next because clearly, they're not done with us.